Punching bag training is just great for physical and skill improvement. It has truly so many incredible benefits and it is also fun! It is actually my favorite boxing training type and some pairs are just more suitable for this training. I have lots of experiences with some of the gloves below and I also gathered information from forums, my trainers and came up with three best boxing gloves for heavy bag training. Below you can find them, my experiences, and sizing information as well. Lasts more than 3-4 years! The best boxing gloves for bag work! First of all, the padding quality is just superb and this is why Title Gel World Bag is at the top. It delivers the shock incredibly well and thanks to this, you can actually get the best heavy bag workout sessions which you ever had! With that, after you punch the padding also returns the original state pretty quickly. So what does this provide for you? When the padding returns the original place, it can protect your knuckles well. I know that many other bag gloves simply can’t pull it off and become useless in no time. However, hands down Title’s padding is the best one on the market. I also used this pair for a really long time in an MMA gym in Samut Prakan, Thailand and it became my favorite bag glove a year ago! Alright, as you may know, the padding distribution actually affects the punching power and this pair’s padding is concentrated mostly on the front side so you can punch faster and harder with it! I have a problematic right wrist and as you can guess heavy bag sessions can be a problem for me. So I always look for really good wrist support and closure and I did not even feel any discomfort with it. You can also expect genuine cowhide leather to last more than 3 years. Actually, many forum members have been using the older model of Title more than 4 years! You have black, red, and pink color selections and you can have a look at Title Gel World Bag and sizing information on the product page. As a final note, even though it is superior to its rivals, Title Gel World Bag also has a more affordable price tag and this is another reason why it is the most popular and the best heavy bag pair on the market. This pair deserves its name. Because it is just bigger than many other boxing gloves. Especially the front side of it is way bulkier. With that, it is really good at absorbing the shock. It is made of Nappa leather and I also had Nappa leather pairs before. These feel “natural”. This pair has more padding on the front side however it also has more padding on the upper side. Basically the shock distribution is more with this pair and obviously, it offers more protection for your knuckles. So if you don’t want to feel so sore after punching bag sessions, Venum Giant 3.0 is a great option. Thanks to waterproof lining these gloves are durable and your hands will stay fresh during the entire workout as much as they can. Like any other Venum Gloves, Venum Giant 3.0 provides very good comfort and it actually provides the best comfort (thermal regulation qualities) on this list. One thing I love about Rival pairs is that these always have all necessary safety features and Rival Boxing Gloves BG-11 is no exception. The wrist closure is a bit tighter than normal and it is a bit longer than usual. The AirFlow feature gets quite good feedback and provides good air flow. I also used Rival Sparring Evolution which is another model and it uses the same AirFlow design and it just worked well. It has latex padding and it does not move much. I know that many people in boxing gyms prefer this style more. This padding is exclusively made for heavy bag sessions and it is durable for intense and long bag work sessions. The design of Rival Gloves has 15″ angle cuff and it provides a natural fit and many people including me prefer this design. Also, it has so many cool color selections (green, blue, white…) and as a side note, Rival Boxing Gloves BG-11 is the best-rated (reviewed) Rival pair on the market and a great alternative for punching bag sessions. You can pick up your own Rival according to sizing information below. Note: You can choose any bag pair on this list according to sizing information above. Cheapest bag gloves which have decent quality! The name includes super but Ringside Gel Super Bag Gloves is actually only above average. It has decent leather quality and decent padding quality. With that, the padding distribution is similar to Venum Giant and absorbs the shock well. Obviously, it is not the best for improving the training quality but it does the job just fine. As you can see the wrist department is larger than normal and secures your wrist quite well. I also witnessed that many people in Greece religiously wear this one for bag sessions and I don’t remember that any of my buddies had a problem with its wrist support. You can expect to train with it around 2 years and considering the price, it is not bad at all. It is all around bag pair which has decent quality and if you are tight on a budget, you can check out here for more information about Ringside Gel Super Gloves. Padding: Firstly, your bag gloves need to have really quality padding and wrist closure so your hands, wrists, and knuckles will be safe during sessions. Also, after you punch the padding should return the front of the pair as soon as possible. If you feel weird about shock absorption, it means that your boxing gloves start losing padding quality and won’t last long. Then it is time to start searching for a new one. So I can fairly say that the padding is important for boxing gloves, but it is just vital for heavy bag gloves. You may want to prefer bulkier and large wrist closure for a better and tight fit. Of course, design and construction determine the wrist support quality but these definitely help. Also, when you consider the training performance, the padding distribution of good bag gloves should also provide you to punch faster so you can get the benefits in a maximum way (physical, footwork improvement etc.). Leather: Honestly, you don’t need perfect leather quality. Because the padding simply can’t outlast decent leather let alone perfect leather. The reason is that you punch a heavy bag all the time and padding has far more deformations than cover material. These boxing gloves on this list do not only get perfect reviews and feedback from forums and authoritative figures, but I also witnessed that many people are satisfied with them. I also know that many bodybuilders train with Title Gel World Bag for better results during heavy bag sessions. Because the padding quality is unmatched and protects you very well while punching. So if you are thinking of getting a pair for doing only punching bag training, I strongly suggest you pick up your own Title Gel Bag Gloves on Amazon. I am sure that you will love every minute of training with it. I hope that you enjoyed reading and if you have any questions about these best boxing gloves for heavy bag or anything to share, please have a comment below and I will get back to you. I hadn’t heard of cowhide leather being used for boxing gloves before. So it must be tough stuff if it scores highly with durability for the Title gloves. Are these gloves designed for just heavy bags or can you use them for other kinds? Also, what about sparring could you use them for that? As you said cowhide is considerably tough and you can’t use these gloves for sparring or focus mitts. I also agree that it just goes perfectly with Title’s pair. I have previously used the Rival Boxing Evolution Bag Gloves and concur with your review. It is definitely a great product. But I’ve used them for a while and now wanted to try a different pair to see if it helps improve performance. These gloves can get expensive and I did not want to spend my money on something that may not last as long. Your review certainly helps shorten that list. Great post. Thanks! Hi Ahmad, Rival is definitely a good pair and I really like the design of them and Rival always provides good wrist wrap feature. I am not a boxer, but these were great reviews. If I was a starting out as new boxer. Which of these would you recommend? 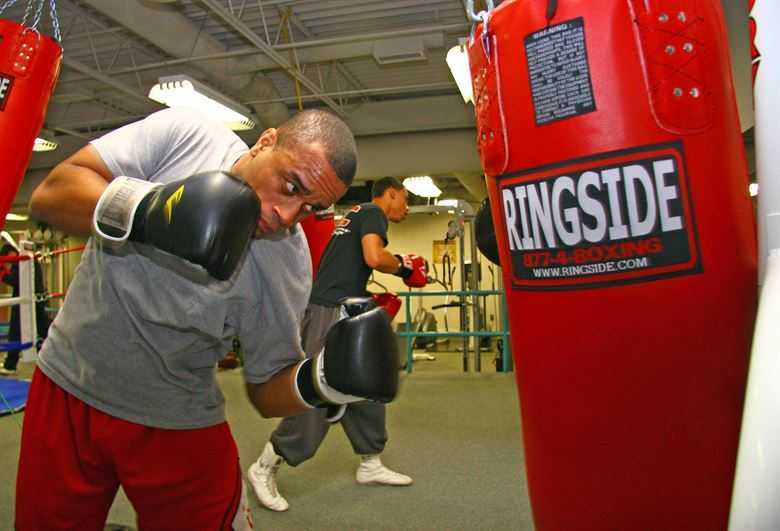 Whether you are a beginner or advanced, you need certain things from heavy bag pair. And Title Gel will provide these for you Nick. What would be your recommendation for a 10 year old child who is just starting to train? Is there a heavy bag that is better suited for kids? I am an absolute beginner so I don’t know too much about all the finer details. Would someone like myself need a pair like these mentioned? If so, I do like the Rival gloves. If you think of spending considerable time with heavy bag and then yes I recommend it and I am sure you will love punching the heavy bag with Rival. Its design is just superb and thanks for dropping by again. These pairs definitely have amazing quality and I know that many professional also use these. I am glad you liked it man. Great-looking choices, Furkan. It’s always a good idea to go with quality and durability, otherwise you’ll just be back buying another pair again before long. As you know, I’ve done some heavy bag work over the last year and am considering making a more serious commitment to the training and investment in proper equipment. I’m really grateful to have you and your site as such a helpful resource. Keep it up! As other types of boxing training it will be much better to go with quality product it heavy bag session. Yes Kevin I remember your punching training routine man. I am glad that you increase the intensity of it. The fun will just begin for you 😉 And I am glad that you find what you are looking for. I have crushed my right wrist in a fall previously. It is a little deformed, but seems strong. Would you recommend the Venum Giant 3.0 for me? Absolutely man, Venum Giant will definitely protect your wrists. Great boxing glove reviews. I am a big boxing fan. If you want to use a mixture of the heavy bag and the speed ball, which boxing gloves would you recommend ? If you do double end bag training any of these gloves will do the job just fine. And if you do speed bag session then check out these boxing hand wraps. I haven’t been able to learn boxing yet, but have always wanted to. I will defiantly keep these products in mind when I am ready to learn boxing, hopefully in the near future, but I have just been so busy lately, anyways great review thanks for sharing. Furkan, great review! A little background. I bought my house and the previous owners left a heavy bag behind. I’m interested in using it so I assume getting gloves is the next step. Do you recommend getting dedicated heavy bag gloves or all-purpose training gloves? Either way, I’m sticking with Title for sure! Thanks. You are really lucky 😉 I hope same thing will happen to me in future. Man if you are interested in doing only heavy bag session and Title is way to go. I have a punching bag in my house, I used to do exercise with it but I have a few years that I don´t use it. Seeing this review makes me want to start over. The gloves that I used were low quality, there wasn´t a decent sports store near me, but with Amazon changed everything, you can get almost anything online. Good reviews. I had a tour in your website.. It is well organised .. I liked the theme, the content and the design..
Hi Rania, I am glad you liked it I constantly work on it and add new content or change my existing content with better information. I really appreciate that you liked it 🙂 These are all great gloves however according to me and many other people, Title Gel is just better than others. Thanks again Rania. My boyfriend is into martial arts and lately boxing and I think he already has sparring mitts but no heavy bag gloves. I’m not really well-versed in this but is there really a need for separate gloves? Guess I should just let him go over this review. He would surely find this review helpful. I would imagine the cowhide leather would be very durable and a glove that keeps your hands sweat free and relaxed would be very important as well since you may be wearing and using them for quite a while. Great pick! I wasn’t aware that there were so many safety features involved in boxing gloves so this article was very informative. Thanks! Great suggestions! I’m looking for new boxing gloves for my brother for a Christmas present, this article will definitely help me choose the best ones for him! He will definitely improve his training performance with any of these and it is surely a good Christmas present. This is a good idea man, these gloves can make a great present and I am sure that he will appreciate a pair for punching bag sessions. When you are pounding that heavy bag you need some good protection on your hands and you have some really great looking heave bag gloves on display. I will point this site to my neighbour as he is into boxing and on the lookout of some quality gear. Hey Andrew, well you should definitely do that because I have experiences with two heavy bag gloves above. These protect the wrist and the padding of these prevents small fractures. These gloves even have some more and design selections. For example, Rival has at least 6-7 different colors. I really appreciate that you share this page with him, more than you ever imagine. Hi, great reviews about boxing gloves. I’m thinking of starting a fitness boxing workout, a bag exercise. For this purpose, the Title Gel World Bag Gloves seems to be suitable. They’re planned for the heavy bag training and protect your knuckles and wrists well. Is it really the best choice on the market? Yeah, there are many people, who have fitness goals, train with that one. It is quite protective so many people, who are into fitness and don’t how to throw proper punches, go with that one as it protects you whether you have a good technique or not. Yes, Title Gel World Bag is still the best choice for bag workouts. I haven’t boxed in years. I was thinking about getting back into it. I have the bag but don’t have the gloves. I think I’ll have to pick up a pair of the Title gel gloves to get back into it. I could use the exercise as well. Thank you for such a wonderful article. It is a great pick for beginners. At first, you will not do hooks or any punching techniques properly and that pair of gloves will protect you. But it is like riding a bicycle. You will get better at it soon. My gym has a heavy bag in the back room which is ideal for cardio during the warmer months of the year. They also have a cool agility ladder to do circuits with, battle ropes, a Matrix machine, and kettlebells. I’d def be interested in buying a pair of these gloves for the heavy bag, as ten solid minutes of constant boxing on it can drain anyone. Thirty minutes? Now that’s a complete workout. Thanks for some of the greatest recommendations. Man, you have a complete gym there. I would love to have plyometric exercise equipment at my current gym so I can progress faster. Plyometrics are good for building muscle and effective workouts. Muscles get quite dense during these sessions. When you also add punching bag training to your routine, you will have more effective workouts. Wow, I didn’t know that a boxing glove can last 3-4 years. I will probably start my training next week – Not sure yet Good review. Many don’t last that long. It is one of the exceptions : ) Great, let me know how it goes!